Westbound 50th Avenue and 47 st NE. 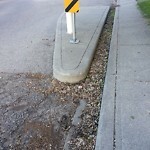 Loose gravel all the way on 50th avenue between the Calgary Police Campus and the West Winds Ismaili Center. Gravel all over road on nolanfield way NW between nolanfield heights and Nolan Hill drive NW (600 meters of road) very dangerous for motorcycles. Kudos and thank yous to the crew sweeping the back alleys today in the lake bonavista community. It's nice having the debris and gravel swept up. Thank you again !! Street sweepers did a great job of cleaning lake placid drive today. Thank you. Great job boys!! Pantego Link runs along the playground here and a large portion of the road looks like it was completely missed during the spring cleaning; despite their being no. Are parked there. Looks like just an oversight. Not sure if it was a city truck or somebody off-roading, but there is a stretch of mud from close to the harvest hills turnoff to Deerfoot trial east on 96ave. Can this be cleaned up?